Band members: Sven Regener (guitar, trumpet, piano), Jakob Friedrichs, Uwe Bauer (drums, until 1986), Jürgen Fabritus (saxophone, until 1986), Richard Pappig (drums, from 1986), David Young (guitar, bass, from 1993), Paul Lukas (bass, until 1995), Christian Hartje (bass, 1995-2002). Regener -- who is known by many as the author of the book and film entitled "Herr Lehmann" -- and Friedrichs met as members of the punk band "Neue Liebe". 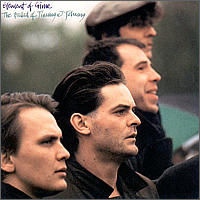 They left to form Element of Crime in Berlin in 1985, a band that is known for its jazzy, melancholy rock songs. Their first successes came in 1987, when the band sold 10,000 albums and they had their first big tour outside of Berlin. Thereafter, however, their success languished, so they decided to reform their music by writing their songs in German rather than English. Their first German-only album appeared in 1991. The change in approach proved to be the right choice. In 1992, they were the opening band for Herbert Grönemeyer and the following year they made it into the music charts for the very first time. Some changes in band membership followed, and in 2000 and 2001, they worked on music for theater and film. Element of Crimes's continued live performances and their new album in 2005 ought to be enough to quell recent speculation about the band's breakup -- at least for the time being.